Remember when our sweet little heifer Raven was born? Well today Raven became a mother. We've been keeping a sharp eye on Raven for the last week or so after we noticed her starting to bag up (meaning, her udder was getting turgid). This morning I noticed she was off by herself in the pasture, typical of what cows do before giving birth. An inspection through binoculars showed her alternately hunching over and lying down. Don and Younger Daughter were off doing errands, which left Older Daughter and me to try to get Raven into the barn. It's a hassle when calves are born outside since we'll need to either dehorn or castrate within a couple days of birth. Plus newborn calves are susceptible to predation. So armed with our pushpoles, we got Raven on her feet and started herding her toward the gate. Notice the hunched back and elevated tail -- classic signs of early labor. Let us just say, it was challenging. It's amazing how fast cows in labor can run, or how high they can jump (as in, over fences), or how well they can hide. But we persisted (and pursued), and at last got her ensconced in the barn. She was not amused. But our timing was just right. Within an hour she was in active labor, lying flat on her side for most of it. Within twenty minutes, the hooves were showing. Proper presentation for a calf is front hooves first, followed by nose, followed by the rest of the body. So far so good. Poor Raven labored very hard. Often she groaned in pain. It took her a long time to get past those little hooves. At last the very tip of the nose was visible. Finally the head appeared. The whitish covering is the broken amniotic sac. ...and then things stalled for a few minutes. Raven lay still, absolutely exhausted. The calf's back hooves were still inside mama. Raven pushed out a huge sack of fluid, but still she just lay there, too tired to move. 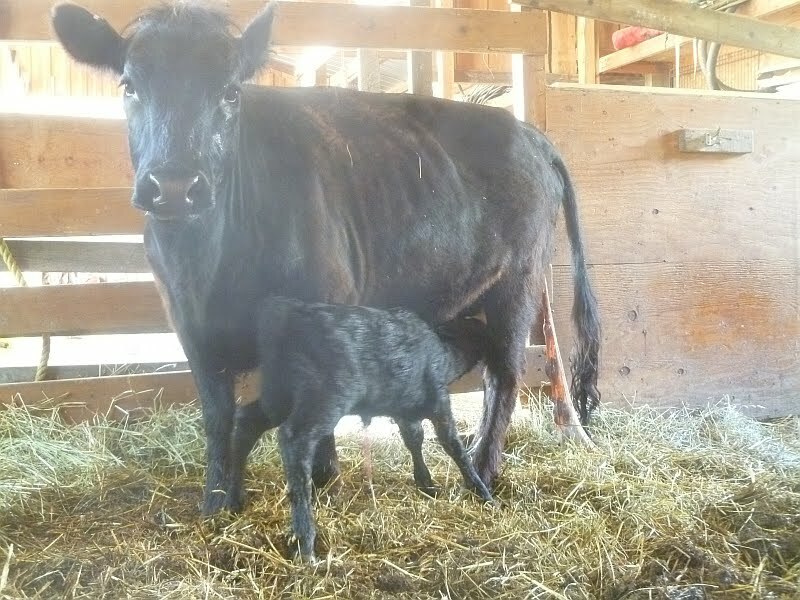 Turned out to be a big calf, and this was Raven's first, too. But after a couple minutes, she recovered and finished the job. ...before turning to the more important task of licking her calf. Within a few minutes, the little calf was sitting upright, looking alert. But shortly thereafter, the calf got the hang of things and started nursing vigorously. All that good colostrum is getting inside her now! 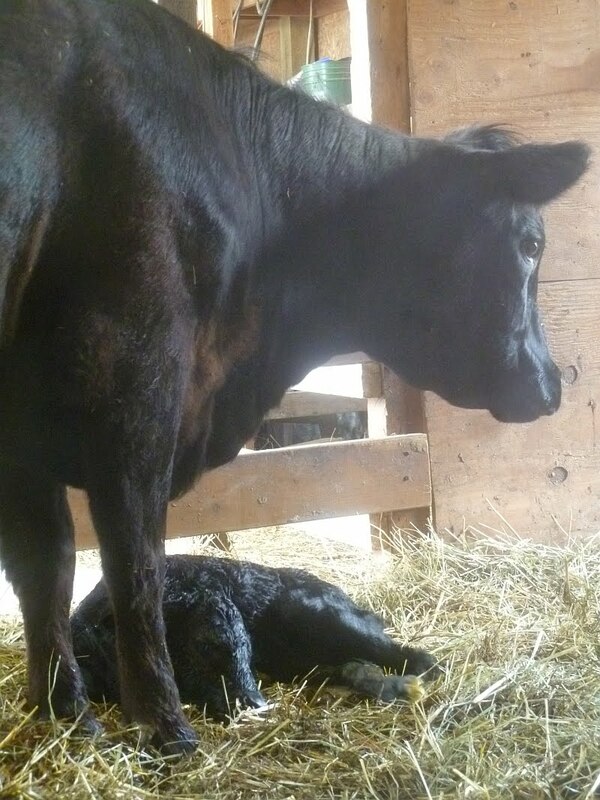 It's a pretty little heifer, and Older Daughter named her Shadow. Nature working her magic. Beautiful! AWWW, the calf looks like mama! congratulations on a new baby and give the mama lots of love and a snack ( one she loves) for pushing out a big baby! Aww, what a perfect baby, thanks for sharing, how beautiful!!!!! So interesting! Thanks for all the great photos. I'm glad everyone is doing well. Oh how beautiful! God is so good! Shadow is a great name by the way! Thanks for taking the time to post so many pictures, which allows the readers to feel like we were there rooting Raven on to motherhood. Shadow is very cute! Thanks for sharing!